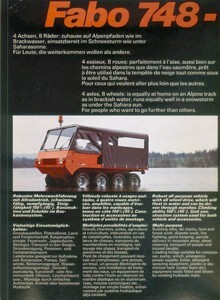 The Fabo 748 was a multi-purpose vehicle with climbing properties up to 45º. 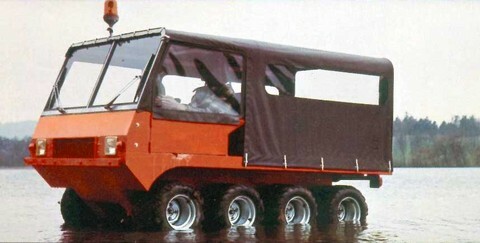 Although shown in running conditions at the Geneva Show, the prototype demanded much longer development time than expected. 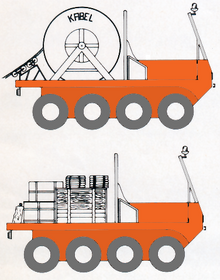 The complex hydrostatic 8wheel drive with chains suffered overheating problems. Renault as motor supplier was asked for help. 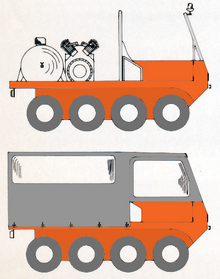 The panzerlike steering concept also required deeper engineering modifications in order to meet road homologation requirements. The engineer responsible for this project was Mr. Rödiger. Therefore management decided to give high priority to the P1 chassis in order to obtain homologation approval fast. First run outs were conducted around the private factory area. The chassis was equipped with a 1600cc engine and showed stunning performances in road testing although the rear suspension required fine adjustments. The “marriage” with the Fabino body was next on the duty list.